• Foster band The Acquaintances were just one of 13 local bands to perform at the Pearl Park Music Festival last Saturday. 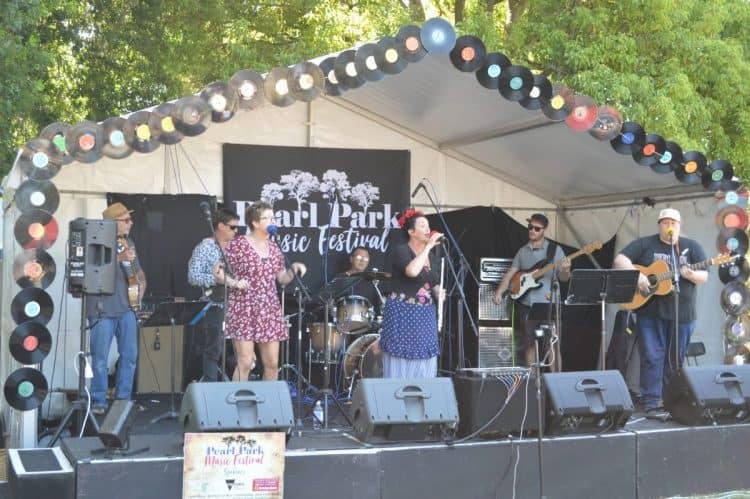 FOSTER’S Pearl Park Musical Festival has been labelled a “roaring success” by its organisers. With a crowd numbering in the thousands, few could argue. “It exceeded our expectations,” festival committee member Gavin Westaway said on Monday. Fellow committee member Bec Bone agreed. The pair, both musicians and singers who performed at various times during last Saturday’s event, were recovering from the biggest of weekends. “During the application to ‘Pick My Project’ we estimated a crowd of between 300 and 500 throughout the entire day. That’s what we were hoping for. If we’d got 500 people for the whole day, we’d feel like we’d done our job,” Bec said. “We reckon there was over 2000 people for the whole day. Just watching all the different segments of the community – with little kids running around, the face painting, the children’s games, the Tai Chi, the Circle Dancers – I feel like there were lots of different groups involved, which was our big aim. Gavin said being “inclusive” had always been the committee’s number one aim, ensuring the festival was a true community event. “We never wanted it to be our little organisation putting on a festival. This was a town thing,” he said. Takeaway food, coffee, groceries and liquor all sold well. RSL volunteers sold more than $6000 worth of drinks at the “Crooked Billet” outlet at Pearl Park. Indeed, the drinks and music flowed freely all day. As far as the next Pearl Park Music Festival goes, no plans have yet been made. However, given the impetus and the positive feedback from those who attended, Pearl Park 2020 seems almost certain. “We haven’t said no to next year, but we haven’t committed yet,” Gavin said. Bec said there would be a discussion “with the town” ahead of any plans for the next event. “As positive as it was – and it really was an amazing day – I think you just have to check. Is this something the town wants every year or is it a biannual event?” she said. Gavin said failure to secure funds in a subsequent ‘Pick My Project’ (if indeed the grants program was again on offer) would mean the town would need to “dig deeper, if indeed they want it to happen again”. Arts Victoria and South Gippsland Shire Council grants are among other potential funding sources. The pair said they felt honoured to have hosted a “gold coin donation” event that did not include a Melbourne headline act, but rather highlighted the prodigious talent within the region. “It was all local musicians playing. This is our local musical environment. That was the whole basis of the original idea. We’ve got all these seasoned, talented musicians right now,” Gavin said. Bec said getting paid was always an issue for local musos. On Saturday, she said, everyone got paid – and then some. “My brother felt guilty that he didn’t have to pay an entry fee, so started buying drinks for the band,” she said. Gavin said the “free aspect” of the festival meant a bigger, more receptive crowd. “I don’t think it would ever be on the agenda to charge people. That changes the whole dynamic of it as well,” he said. Boundaries and bouncers would have been a definite buzz kill. *While the list of people to thank was long, Bec and Gavin said it would be remiss of them not to mention the Bendigo Bank, children’s game organisers Tika Hicken and Jan O’Dea, the State Government, the local community, festival advertisers, the Foster Chamber of Commerce and associated businesses, Rebecca Matthews from Manna Gum Community House, Foster Museum’s Meg Rogers, information and merchandise volunteer Marge Arnup, Foster Library, Stockyard Gallery, Simon Boucher, “Dog” Sparks, ABC Gippsland, the Mirror, Kath and Gerald Finn from Foster Foodworks, Foster Visitor’s Information Centre, the musicians who performed and the Pearl Park Musical Festival commitee.